Longline cardigan. Edge to edge style with No buttons or fastenings. Lovely cardi looks great with jeans. Tu cardigan size 10. Dispatched with Royal Mail 2nd Class. New Ladies Tu Cream Crochet Longline Cardigan Uk 16. Fab new long cardigan Measures 27 inches from underarm to underarm and 43 inches from top of shoulder to hem. Loose fit would also fit 18 Condition is New with tags. Hello, This listing is for a beautiful baby pink, soft knitted sweater. 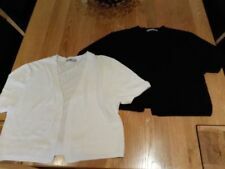 It’s Italian and labelled as one size, will fit a 33-34 inch chest, it has long sleeves with slits at the shoulder and elbow. It’s fitted at the hips, but has some stretch. It’s been worn and washed, but is in good condition. Happy Bidding. Pretty Pink Cardigan as pictured. Lace edging (see pics). Length 25 ins shoulder to hem at the back. Labelled Size 14. Underarm sleeve seam = 13 ins. Edge to edge style (no fastening). Short sleeved, open-fronted bolero style cardigan / cover-up. Fine knit, lightweight. We have this white cardigan for sale, this is in excellent condition, size 14 and was bought from TU. This is a waist length cardigan, crew neck, long sleeves, front button fastening and is machine washable. Ladies TU Black Open Front Cardigan Size 10. Striped design. Only worn on a couple of of occassions so in excellent condition. Dispatched with Royal Mail 2nd Class. TU Block Colour Jumper Size 20. Condition is Used. Dispatched with Royal Mail 2nd Class. Great condition drape style cardigan from TU. Heart print jumper Size 14. Condition is Used. Dispatched with Royal Mail 2nd Class. New listingTU Ladies Jumper New With Tags. Cotton Blend. Size 12. TU Ladies Jumper. Cotton Blend. New Price £18.00 3/4 Sleeves. Shoulder to hem 27". Armpit to Armpit 22". Very nice ladies cardigan. Length 26". Armpit to armpit 20". This is for a never worn TU pink 3/4 sleeve collarless thin cardigan with pearlised buttons down the front and beaded and sequin trim along the neckline, in cotton & nylon for size 16. This can take a while so we aprieciate your patience during this process. It's a thin jumper. Would rather say knitted top. Due to the lightning and different device (yours and mine) settings, colours may differ slightly. Ladies Jumper Size 12 Navy, round neck, long sleeves, pit to pit 21"/53, length nape to hem 22"/56cm 60%:cotton 20% viscose 20% polyamide. Back of neck to hem 28". Armpit to armpit 27". Lovely orange button front cardigan. Nice detailing at the top of the arms and orange coloured button, all present. Length 22" U to U 20". UK only seller From a smoke and pet free home. Free P&P Any questions please ask. 63% cotton,13% polyamide,24% polyester. Very on trend yellow gold and ivory delicate loose-weave knit. Back length 31". Ladies TU size 14. Jumper / sweatshirt with short sleeves. that have a little puff detail on the shoulder. Mid blue colour. 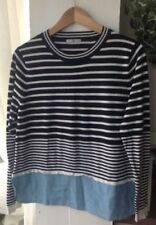 Ladies Blue Chunky Cotton Blend Cable Knit Jumper UK 16 Relaxed Casual Student. Condition is Used. Dispatched with Royal Mail 2nd Class. TU WOMEN'S SPARKLY COTTON BLEND JUMPER . Condition is Used. Dispatched with Royal Mail 2nd Class. Very nice ladies jumper. Armpit to armpit 19". Length 24 ". The fabric is a cotton nylon wool blend. Style: Cardigan. Material: Cotton Nylon Wool Blend. Denim Waistcoats. Denim Jackets. Size Guides. Main Colour: Blue. Size Guide. Pretty TU cardigan cream/beige floral. In a size 14. 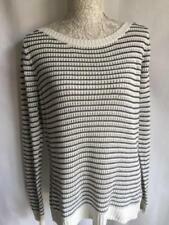 Tu Winter White Cotton Blend Funnel Neck Jumper Size 14, . Condition is used size 14 pit to pit is approx 21”inches.smoke pet free home. TU Ladies Jumper New With Tags. Cotton Blend. Size 12.